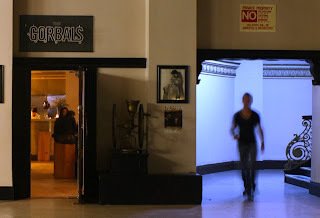 The 99 Cent Chef continues his art/photo & eatery series with Restaurant Nocturnes Part 2. Hitting the streets at night, I take you from Highland Park's Huarache Azteca, for a $2 huarache (a homemade corn-masa flatbread topped with meat, cheese, cilantro, onion and salsa), to possibly the most expensive sushi banquet in L.A. (a three-hour experience at $350 - not including drinks and tip) at world-reknowned, reservations only, Urasawa on Rodeo Drive in Beverly Hills. 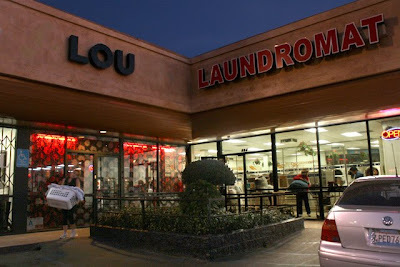 You'll get a kick out of my tasty photo series in which I combine the offbeat and the serious in approaching Los Angeles's restaurant scene. I like to mix it up: the contrast of wine bar Lou with the laundromat next door in a Hollywood mini-mall; and the sight of guitar-wielding mariachis entering Mexican gourmet seafood restaurant La Serenata De Garibaldi in Boyle Heights. I breeze through 25 restaurants in just over five minutes -- I'm sure you will find something that suits your discriminating palate! 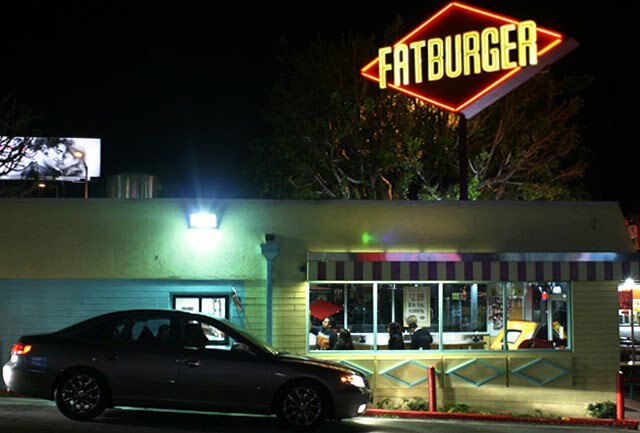 Locals will recognize some of these, and you out-of-towners can feast your eyes on the variety of L.A. eateries. 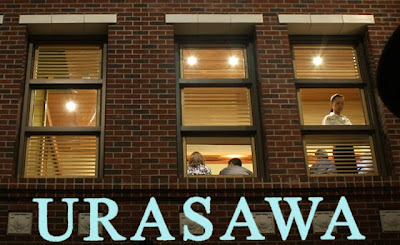 If you ever visit us here, be sure to refer to (and click on) my restaurant list at the end of this post - which takes you to each website link (or a restaurant review) in order of appearance, and to my original twitpic post. This series is ongoing, and I've shot 100 restaurants (and counting), so look out for more Nocturnes in the near future. You can see the latest photos of where I've been by visiting my twitpic link: just click here. Bon appetit, and I hope to see you at our unique dining establishments! Play it here. The video runs 5 minutes 7 seconds. You can see Restaurant Nocturnes Part 1 by clicking here. Restaurants in order of appearance - click on text to see the website (or review), and my original twitpic link. 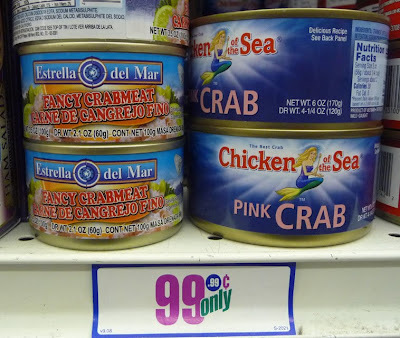 thanks to 99.99 cent (okay $1) six ounce cans of Pink Crab from Chicken of the Sea, on sale at my local 99c only Store. 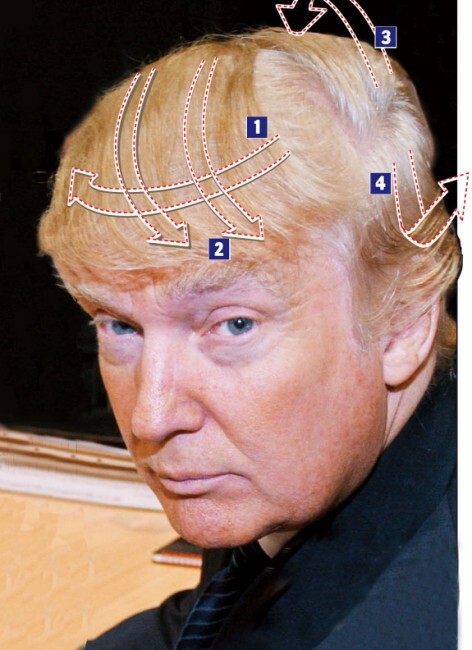 I'm starting the day living large like combed-over real estate mogul Donald Trump. Next to lobster, crab is the crown jewel of pricey seafood. Those million dollar, bloated bonus-sucking, NYC Wall Street fat cats would be green with envy if they saw me digging into this Billionaire's Crab Omelet, which could be served at One Central Park West's Michelin 3-Star tony French restaurant Jean George (located in the Trump International Hotel, of course). 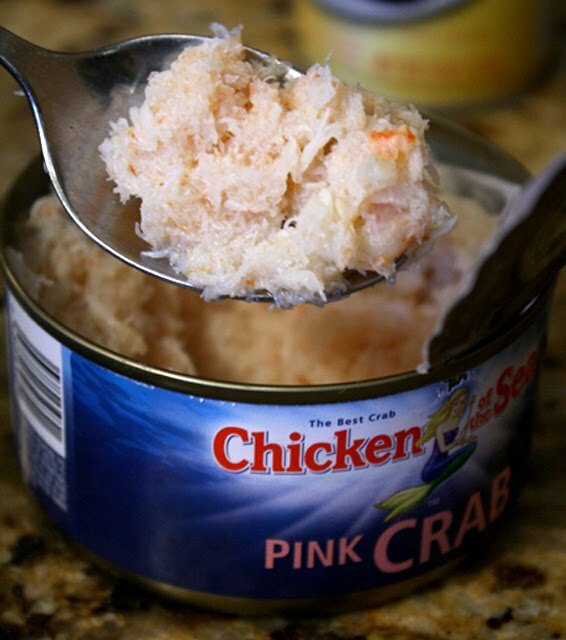 Although from a can, this crab is a tinned Tiffany seafood bauble that any working stiff can afford. (You don't even need a million dollar line of credit, like Newt and Callista Gingrich, from the famed NYC jewelry emporium!) 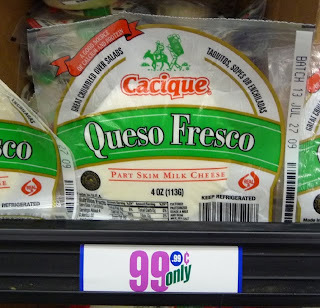 Drained and folded into an omelet, and combined with another 99c only store favorite, Mexican Queso Fresco cheese, is one of the best ways to use it. Yesterday I tried a Maryland Crab Cake recipe that did not work - this crab is too shredded to combine with crumbled crackers (you need real lump crab for that). Sometimes a recipe using budget ingredients crashes like a junk-bond derivative, but I managed a credit swap and cashed out in time, with my golden parachute of a breakfast windfall ! The only trick, with this dollar store staple, is to make sure the canned crab is well drained. I squeezed out most of the water, then set out a couple of tablespoons, piled high on a small plate, to drain again. The six-ounce can holds enough crab for three or four omelets; I've had two this week, so far. You can use your favorite omelet recipe - just add a couple of tablespoons of crab for my lavish Billionaire's Crab Omelet. One 6-ounce can of crab - a smaller can is fine to make fewer omelets. Make sure to drain. 2 - 3 eggs per omelet - depending on egg size. 1 tsp. of oil, or oil spray your omelet pan. Other optional ingredients include: cheese (queso fresco), cooked spinach, mushrooms, bell pepper, bacon, sun-dried tomato, etc. Drain crab meat, and cook any favorite extra omelet ingredients (like spinach, mushrooms, bacon, cubed ham, etc.) I lightly beat 2-3 eggs in a bowl and add to a greased hot omelet pan. When egg is half cooked - the bottom is firm and the top is still wet - I add drained crab and crumbled cheese, or any extras you like, to half of the omelet. 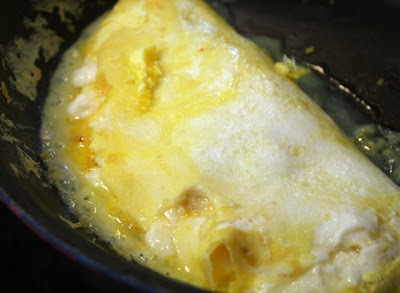 I fold the omelet when it is almost done; it seems easier to work with that way. 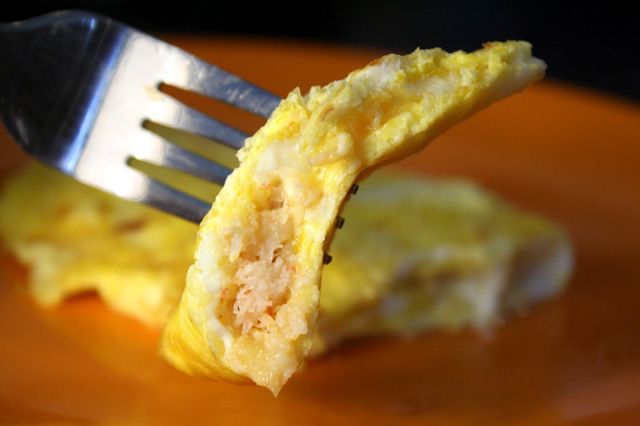 Omelet should be firm along the edges with a slight amount of liquid egg in the middle. Gently loosen cooked bottom of the omelet with your spatula. Fold omelet in half. 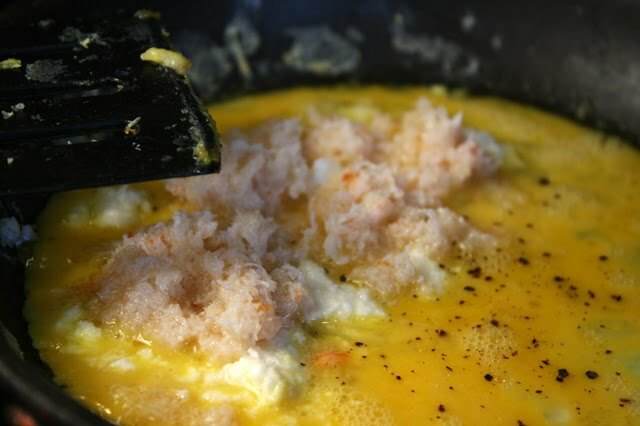 Make a couple of small slits in omelet so excess liquid (from heating crab) will drain out. Cook another minute or two, depending on how "dry" you like the inside of your omelet. 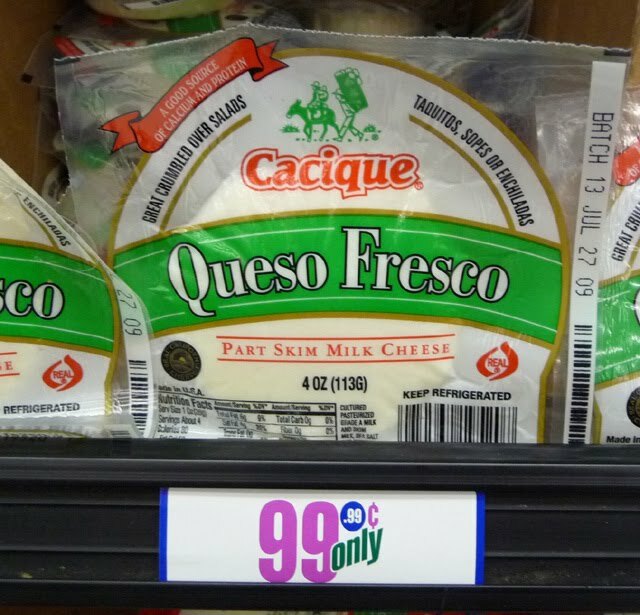 I love these small 4 ounce pucks of Mexican Queso Fresco. The cheese is crumbly like feta, but with a milder taste, and it's a salty curd. I put it into everything I can think of: simmered in a Calabasitas stew of squash, tomato, chile and zucchini; melted into an avocado omelet; crumbled over salads; and in Cactus Quesadillas. I have been finding jars of cactus at my local Latin market and 99c only Store lately; and have been trying to come up with uses for these sliced, peeled, unprickly paddles. They have a taste similar to okra, just lighter in flavor. You can sprinkle some over a salad like you would with canned beets, or heat them up as part of a vegetable soup. Because wheat tortillas are priced at a dollar a package, I've recently started adding cactus to quesadillas. 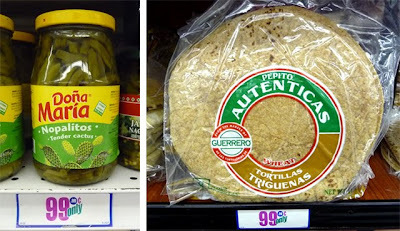 The cactus is pickled, so you need to drain it, and pat it dry with a paper towel, or small puddles of water will form in this cheesy Mexican delicacy. 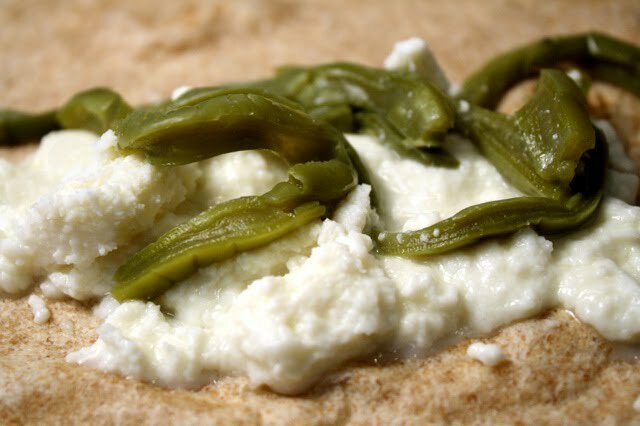 For a quick and unusual dish, try out my Cactus Quesadilla. Ingredients (1 serving)1 flour or wheat tortilla. 2 ounces of Queso Fresco - half of the 4oz. package. Okay to substitute with your favorite cheese. 2 tablespoons of cactus - drained and patted dry with paper towel. Heat pan or grill. Drain and pat dry cactus from jar. Place tortilla on grill or pan and crumble cheese onto half of tortilla. Add drained and dried cactus over cheese. 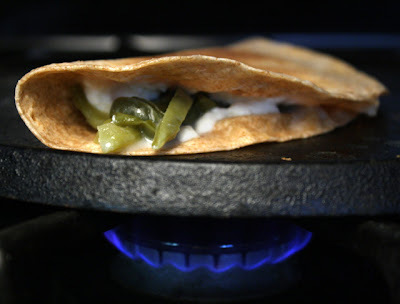 Fold in half and lightly brown tortilla on each side until cheese is melted. The Fine Art of Dining - Yeah, I said it, but don't worry, this Chef is far from a pretentious food snob - I'm more of a bottom feeder. When the latest Food Network Top Chef winner opens up a downtown bistro that combines French and Eskimo cuisines, you won't find this Chef there anytime soon. 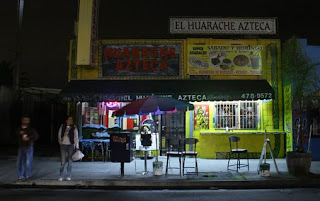 But if I'm driving down Jefferson Boulevard and spy an upright sidewalk flaming grill with al pastor, and I see the flash of cleavers mincing chewy tripas on a grease-stained wood block, held up by a rickety folding table -- that I find hard to pass by. In my latest video, Restaurant Nocturnes, I steer you through a neon-lit tour of L.A.'s dining establishments: everything from the latest and hottest to the old school, and from high-end to hole-in-the-wall. I can't say I've eaten in every restaurant I photographed (just the cheap ones) -- but I have chatted with the chefs, managers, maitre d's, waiters and bartenders to get a thumbnail audio clip description. I started this series three and a half months ago, when I spied Susan Feniger's eight foot "walking man" signage hovering over the entryway of her restaurant Street - what a knockout piece of neon! I had to pull over to get a quick shot of it, and I haven't stopped shooting since. 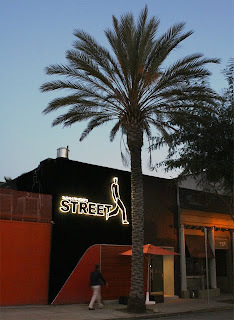 Los Angeles at night is a city of light - and my goal has been to capture that through its cafe society. 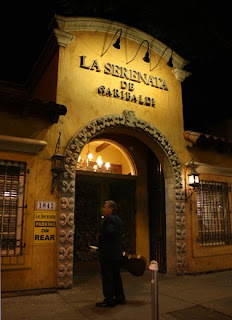 I choose which eateries to shoot on a personal basis -- sometimes the restaurant strikes me as visually interesting; in other cases, it may be my go-to for midnight birria tacos after a Film Noir double feature at the Egyptian Theater. I've tried to mix it up. 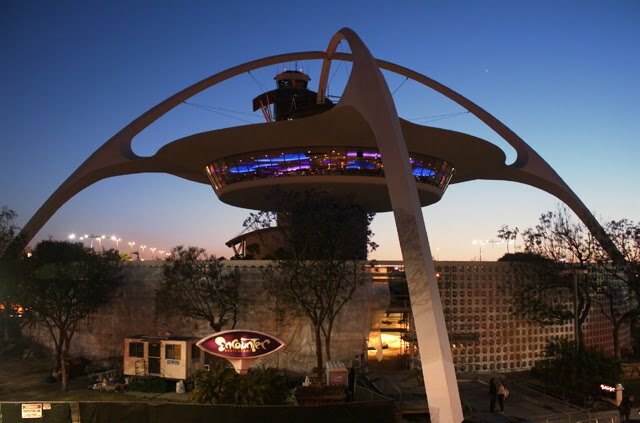 Plus, everything just looks cooler at night. Each restaurant is lushly shot in a clip that lasts 10 -15 seconds; then it's off to the next one -- so don't worry, you won't get bored. I've shot stills of more than 100 cafes, with a tip of the chef's hat to restaurant critic Jonathan Gold's annual 100 (or 99) lists. But for this video, I've paired my images down to just 21 - presenting the most interesting mix in a whiplash five minutes. And I've provided a restaurant list (with links), in order of appearance, at the end of my post. This is all original content, not e-gurgitation (my term for recycling other peoples' web-work and repurposing it). I start shooting during sunset (look for photos that have a blue sky) and continue until the restaurants start to close, usually around 10 p.m. So hey -- if you ever see me out in front, adjusting my tripod, stop and say hello, or better yet, let's get a beer ! By the way, these images are composed in Chefvision - my own technique of shooting 100 or so still photos per restaurant and stringing them together as a short movie - that's why the video is all so bright & sharp, even for nighttime! So -- click, play, and let The 99 Cent Chef shepherd you through twilit L.A. streets on a unique tour of our bustling, ever-changing restaurant scene (locals, check off the ones you've been to). And Restaurant Nocturnes Part 2 is just a click away, here. Play it here. The video runs 4 minutes 51 seconds. Restaurants in order of appearance, with links to their website (or a review), and my original "twitpic" photo post -- just click on underlined text. 99 thanks to the restaurant managers, hosts, chefs, waiters, busboys and patrons. 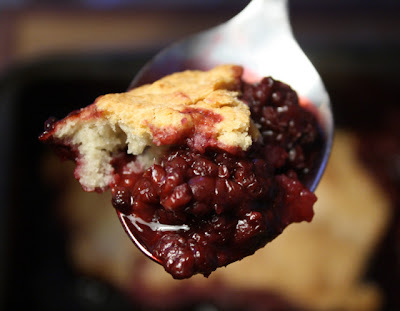 A delicious childhood memory started with picking a bucket of blackberries in the summer. After eating handfuls plucked off the vine, I still looked forward to eating more - cooked to perfection in Mom's blackberry cobbler. You won't get thorn torn sleeves, or scratched-up hands, with The 99 Cent Chef's recipe. 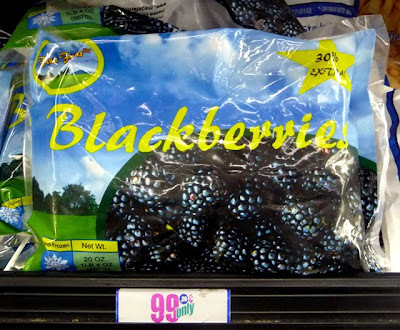 I've been buying 20 ounce frozen packages of blackberries at my local 99c only Store the last few weeks. The crust is a simple biscuit topping made with butter, flour, baking powder, sugar and water. Defrost the blackberries, and add some sugar and cornstarch (or flour) dissolved in the thawed blackberry juice. I've also seen frozen strawberries; I bet a Strawberry Cobbler would be just as good! 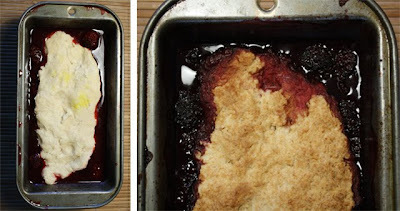 This easy recipe will do until the next time I visit Mom during blackberry picking season. You can make this anytime you find frozen fruit (or canned peaches for that matter) on sale. 16 - 20 ounce package of frozen blackberries, thawed. Okay to use less, just reduce other ingredients and use less crust. 1/4 cup of sugar - okay to substitute with your favorite sweetener. 1 tbsp. of cornstarch or flour. 1/4 cup of sugar - or a favorite sweetener. 1 tsp. baking power - optional. It makes a thicker crust. 1/4 stick of butter or shorting. * Double sugar amounts for sweeter cobbler - I tend to keep recipes low sugar. In a loaf pan add thawed blackberries. 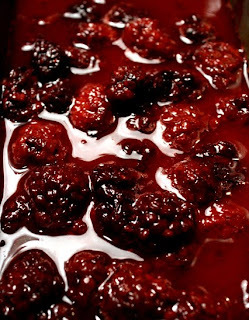 In a small bowl add blackberry juice and dissolve in 1 tbsp. of cornstarch (or flour) and sugar. Mix well and pour over blackberries. To make cobbler crust, mix together (in a large bowl) 1/4 stick of sliced butter with all the crust dry ingredients. Blend well by hand for a couple of minutes. Add water and mix another couple of minutes to form a dough. It does not to be mixed to perfection, just enough to hold together in a ball. Hand press it out big enough to almost cover your baking loaf pan - to about a one inch thickness. Lastly, place dough crust onto blackberry filling that is in the loaf pan. Dough should not go all the way to edges - so the filling will not boil out. Leave a little room at the top, so the filling can roil and bubble. Place into a 375 degree oven for about 30 minutes. You may want to place cookie sheet under cobbler loaf pan, just in case. Remove from oven when done and allow to cool for a few minutes, as the filling thickens. I like to serve warm, and with ice cream? I'm interrupting my run of budget entrees to give local readers a Deal of the Day heads-up. 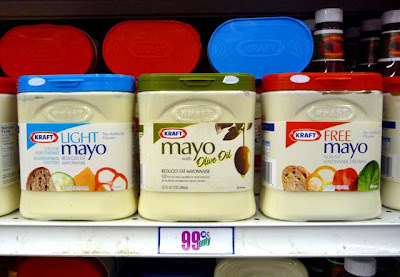 While gathering ingredients for the upcoming recipes of: Crab Cakes, Calabasitas (a stew of squash, chile, tomato, corn and cheese), Roast Chicken in Prunes, Potato-Crusted Fish, Cactus Quesadilla, and Sweet and Sour Pork; I ran across huge two pound tubs of Kraft Mayonnaise for 99.99 cents, at two 99 cent Only Stores yesterday! Click here, and here, for locations. Stock up with this Deal of the Day for a summer of cool and creamy potato, egg and tuna salads. I always buy lite mayo, but they are also stocking fat free, and reduced fat with olive oil. There were many stacked unopened cases on the floor, so there should be plenty; or it will be coming soon to your neighborhood 99c only Store, too.